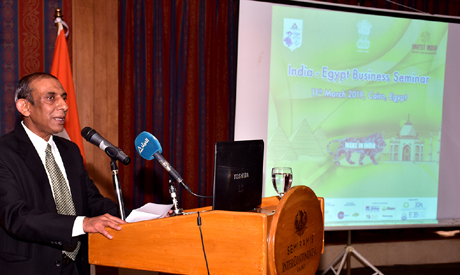 As part of the seventh India by the Nile Festival, the Embassy of India in Cairo, in association with Invest India, organised seminars entitled “India-Egypt Business” in Cairo on 11 March and in Alexandria on 12 March. A high-level delegation from Invest India (the Investment Promotion and Facilitation Agency of India), led by Managing Director and CEO Deepak Bagla, was visiting Egypt to address the seminars and to meet Egyptian businessmen and investors. India’s Ambassador Rahul Kulshreshth, Bagla, and other prominent speakers from the Egyptian business community including the Federation of Egyptian Industries (FEI), the Egyptian Businessmen Association (EBA), the Egypt-India Joint Business Council (EIJBC), the Cairo Chamber of Commerce and the Egyptian Junior Business Association spoke at the Cairo seminar. Bagla, First Secretary at the Embassy of India in Cairo Vinod Bahade, and senior businessmen from Alexandria’s Chamber of Commerce and the Alexandria Business Association spoke at the seminar in that city. The seminars focused on the current status of bilateral trade and investment and potential areas for enhancement in the context of various flagship programmes from the Indian government, including Make in India, Digital India, Skill India, Startup India and Smart City Mission. Egyptian investor and business community were updated about policies and initiatives taken by the government of India to promote investments in the country. On Sunday, a seminar titled “Know India’s Tourism” will take place at Cairo’s Grand Nile Hotel at 9:30am. Ambassador Kulshreshth and assistant director of the India Tourism Office in Dubai, A. Seetharaman, as well as senior officials from the Egyptian ministry of tourism and representatives from the Indian and Egyptian tourism industry, are scheduled to attend.